The Directorate-General for Research and Innovation is a Directorate-General of the European Commission, located in Brussels, and responsible for the European Union's research and innovation policy and coordination of research and innovation activities. It is headed by Commissioner Carlos Moedas and Director-General Jean-Eric Paquet. To do so, the DG contributes to the European Semester by analysing national R&I policies, by assessing their strengths and weaknesses, and by formulating country specific recommendations where necessary. It monitors and contributes to the realisation of the Innovation Union flagship initiative and the completion of the European Research Area. It funds excellent Research and Innovation through Framework Programmes (currently Horizon 2020) taking a strategic programming approach. Since the organisation of the DG changes from time to time, is best to refer to the Organisation Chart on the Research and Innovation web site. To fulfil its mission, the Directorate General works closely with several other Commission departments (DGs) and executive agencies. ^ "Directorate-General for Research & Innovation - Mission - Research & Innovation - European Commission". Ec.europa.eu. Retrieved 2016-01-06. ^ "What is Horizon 2020? - European Commission". Ec.europa.eu. Retrieved 2016-01-06. 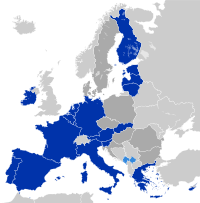 ^ "Related Commission departments (DGs) & agencies - Research & Innovation - European Commission". Ec.europa.eu. 2015-08-25. Retrieved 2016-01-06. This page was last edited on 28 March 2019, at 14:11 (UTC).